This Friday is expected to be the UK's first ever billion pound shopping day. Black Friday is fast becoming a day we love - and a day we hate. And we all expect to watch, with a kind of delighted outrage, dramatic footage of excessive spending and violent shopping habits. It is not without humour. One tweet ran: "Make every day feel like Black Friday by knocking over your family as you run out of the house with the TV." But the day is fraught with conflicting emotions. While one shopper tweets "Can't wait for #BlackFriday", another begs: "pls don't support any retail stores with black friday deals today. just stay home w ur family or something". Even in the US, where it all started, there are doubts among those you would suppose have the most to gain. Fortune magazine has called it in an article "The Most Rotten Part About Thanksgiving Day", complaining that low paid employees don't get a break and that stores see discounted sales concentrated on one day, and higher margin sales falling off for the next four weeks. So the BBC canvassed a range of views on the shopping phenomenon that is Black Friday. Asda has been the UK's most high profile Black Friday dissident, due to what it calls "shopper fatigue setting in around flash sales on big-ticket, non-essential items at Christmas." The move is all the more unexpected since its parent company Walmart in the US is at the forefront of Black Friday discounting. Asda President and CEO, Andy Clarke said: "The decision to step away from Black Friday is not about the event itself. "This year customers have told us loud and clear that they don't want to be held hostage to a day or two of sales. With an ever changing retail landscape, now more than ever we must listen carefully to exactly what our shoppers want and be primed and ready to act the minute their needs change. "When it comes to putting customers first, Asda has always led the way, which is why we're just as confident in our decision to step away from Black Friday as we were in introducing it to the UK." Image caption More Green than Black - Mount Rainier National Park in the US is offering free entrance on Black Friday. In the US one apparel company has turned its opposition to Black Friday into a marketing opportunity, actually closing its doors on Thanksgiving and Black Friday. REI sells outdoor and recreational kit online and in 143 outlets and, appropriately, told its customers not to spend money, but to get outdoors. It claims its #optoutside has been taken up enthusiastically. It estimates a million Americans have committed to "opt outside" activities on Black Friday. Jerry Stritzke, CEO of REI tweeted; "The response has been humbling and inspiring"
He had given his management team the task of coming up with a novel marketing campaign nine months ago. He said: "They came back with this, and I have to admit, the idea was a bit shocking. But the more we thought about it, the more excited we got. "I don't expect to see a lot of retailers closing on Black Friday. The attention creates the platform to talk about the power of getting outside." "My three-year-old grandson is coming out [to Washington] for Thanksgiving, so we're going to go out on the mountain and see if we can find a little bit of snow." Meanwhile many of the US National Parks are pushing what they call "Green Friday" to get people into the wilderness, with Olympic and Mount Rainier national parks offering free entrance passes for the day. Many retailers though are true Black Friday believers. In the UK Currys PC World expects to make over two million deliveries and install 12,000 washing machines, 6,000 cookers and 3,000 TVs over what it calls the "Black Friday period". Aware of Asda's argument that customers can feel they are being forced to buy on a single day it has introduced a Black Tag scheme to spread some of the bargains over ten days. Stuart Ramage, ECommerce Director at owner of Currys PC World, Dixons Carphone, says: "Black Friday has grown enormously over the last few years and we're now expecting it to be the largest sales event of the year. "By starting our 10 day Black Tag event on Monday, and releasing additional fantastic deals for Black Friday itself, we've worked hard to make sure our shoppers can pick up the best deals at a pace that suits them, whether that be in-store or online." But there is analytical evidence that Black Friday is not doing much good for the retailers themselves. At the retail and brand consultancy, Fitch, Alasdair Lennox, the executive creative director for Europe, Middle East and Africa, argues that the effect on profitability is marginal because of the deep discounting. He said: "From the UK perspective all the retailers got on board Black Friday, albeit reluctantly, but they are now at a tipping point where they have to decide or whether to stay on board or hold back. "You are seeing companies like Asda pulling back and Tesco having a later opening time, and others will follow. 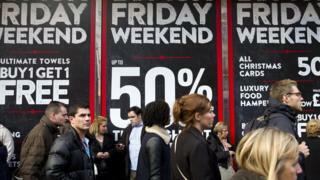 "The problem with Black Friday is that at the top end it tends to erode brand equity. So, for instance a customer is saving up to make a purchase and sees the price go up, then go down on Black Friday and then rise again - and that undermines their trust and confidence in the product. "If you are a discounter, that's fine. But if you are at a high end retailer, then that's a problem"
The Bookseller Association's president Tim Walker thought up the concept for bookshops, many of them struggling with the the competition from Amazon, which is often credited with importing Black Friday to the UK. He said: "What you do on Civilised Saturday is up to you. It could just be serving tea and cakes in the afternoon or maybe by having an invitation-only event with prossecco, canapes and a string quartet in the corner." So, the tiny Bookends bookshop of Fowey in Cornwall is offering customers 10% off all stock, and the children's bookshop, The Bookworm, at the other end of the country in Selkirk, is hosting a Famous Five Tea Party. Dulwich Books in London will encourage shoppers to browse at leisure with afternoon tea, homemade cakes, and winter warmer drinks. Philip Maltman, principal bookseller at Dulwich said: "Civilised Saturday is absolutely in line with our identity as an independent bookseller. Obviously it brings in more people and we sell more books . But if we just pile them high and sell them cheap it does not appeal to kind of customers who want to use an independent bookshop like us." What is Black Friday and what does it mean?